*Complimentary WIFI for guests* Close to the tubes and buses in the heart of London. Our elegantly re-designed interior and fully equipped, comfortable bedrooms are complemented by our intimate Library Bar which serves drinks and light snacks. Please note that whilst we only have a breakfast restaurant, there are a variety of good restaurants nearby. Complimentary Wireless Internet Access. ·From: Heathrow Airport. 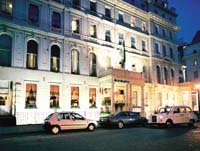 The Best Western Mornington Hotel is a five minute walk from Paddington Station via Praed Street. Lancaster Gate Underground Station about three minutes walk. Library Bar, on premises, Bar/Lounge, International, Open for: lunch, Light snacks. Open from 4:00 p.m. to 11:00 p.m., seven days a week.